An amethyst and diamond necklace. Designed as a series of graduated oval-shape amethysts, with rose-cut diamond bow spacers, to the belcher-link back chain. A late Georgian gold rock crystal doublet and diamond comet brooch, circa 1820. The rectangular-shape foil-back rock crystal doublet, with scrolling spacer, to the foil-back old-cut diamond terminal. Estimated diamond weight 0.45ct. An 18ct gold diamond seven-row dress ring. 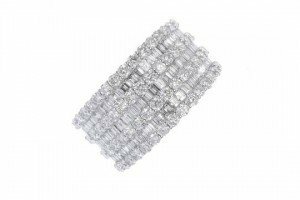 The alternating brilliant and baguette-cut diamond lines, to the plain band. 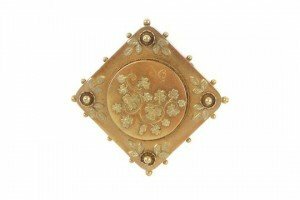 An early 20th century gold foliate panel brooch. Of square-shape outline, the foliate embossed disc, to the similarly designed panel surround with bead accents and border. 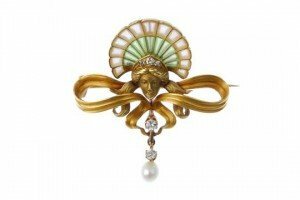 An Art Nouveau gold diamond, pearl and plique-a-jour brooch. Of scroll design, the cultured pearl and old-cut diamond drop, to the old-cut diamond crowned figure and green and colourless plique-a-jour surmount. An early 20th century gold enamel and diamond flower brooch. 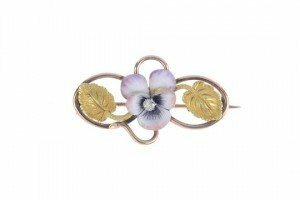 The white, pink and purple enamel pansy, with old-cut diamond central highlight, to the scrolling openwork surround with textured leaf accents. A French Art Nouveau bronzed metal novelty frog candlestick: holding a lotus pod and standing on a lily pad. 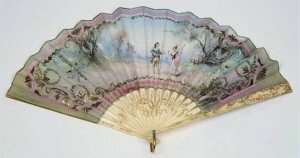 A 19th century French painted silk and bone fan: the silk leaf painted with young lovers in a rustic setting, within a pink border, the sticks and guards with incised gilded decoration. 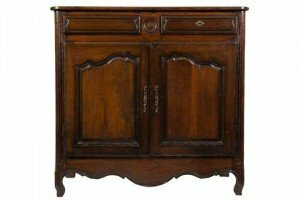 An 18th Century French Provincial walnut side cupboard:, the rectangular top with a moulded edge and rounded corners, fitted with two moulded panel frieze drawers centred by a roundel, enclosed by a pair of cartouche moulded and fielded panel doors below, between rounded fluted corners, on short shaped legs. 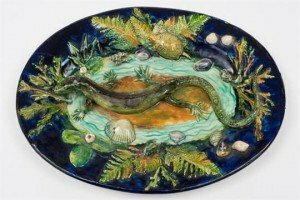 A French Palissy Ware dish: of oval form, modelled with a lizard, small terrapin and frog amongst scattered shells and foliage, reserved on a blue ground. 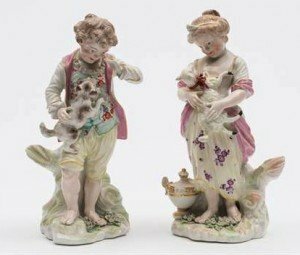 A pair of Derby figures of French Shepherds: modelled as a boy and girl, the boy holding a leaping puppy, the girl with a lamb, on naturalistic stump bases. 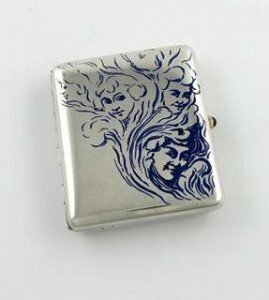 A French silver and enamel cigarette case of rectangular form, enamelled with three female head within smoke, with a push button stone catch. 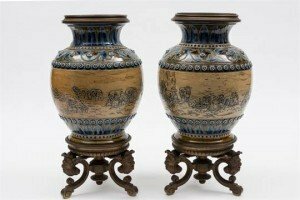 A pair of Doulton Lambeth lamp bases decorated by Hannah Barlow: of oviform with cast bronze base set on three scrolling winged grotesque supports, the salt glazed stoneware body of oviform sgrafitto decorated with an encircling band of grazing sheep in a landscape flanked by stiff leaves, scrolling foliage and applied florets. 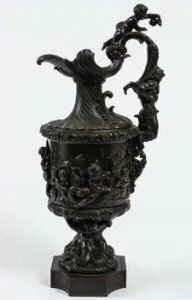 A 19th Century French bronze ewer: of neo-classical form, decorated with putti collecting fish , the scrolling handle in the form of a satyr being tormented by a putto pouring wine on him, the whole supported by three mermaids, on a shaped cruciform base. 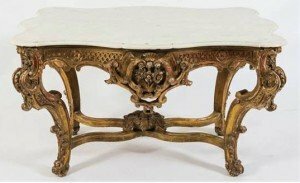 A 19th Century French carved giltwood centre table of serpentine outline in the Louis XV taste:, surmounted by a panel of white veined marble, having a moulded edge and rounded corners, the lattice shaped apron decorated with flower heads, acanthus leaves and paterae on scrolling cabriole legs with similar decoration, united by curved moulded X frame stretcher with central flowerhead and foliate boss. 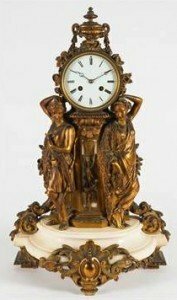 A French Victorian gilt metal and marble mantel clock: the eight-day duration movement striking the hours and half-hours on a bell, the round white enamel dial having black Roman numerals and blued steel moon hands, the gilt-metal case having a white marble and gilt-metal octagonal pillar to the centre flanked by two classical figures on top of which stands the movement surmounted by a matching urn, all standing on a shaped and moulded white marble half-round base. 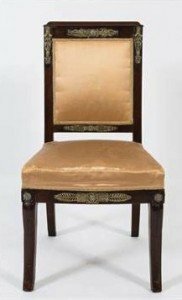 A 19th Century French Empire mahogany and brass mounted salon chair:, the upholstered panel back within a surround with applied anthemion, scroll and flowerhead ornament, the bowed upholstered stuff over seat with similar seat rail on sabre legs. 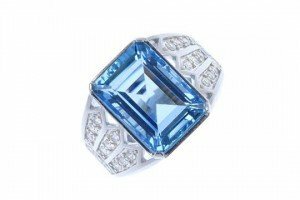 An aquamarine and diamond dress ring. The rectangular-shape aquamarine, to the pave-set diamond three-row line sides. 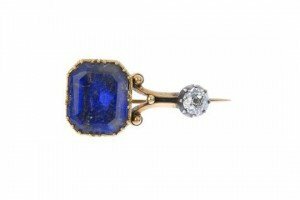 A mid 20th century sapphire single-stone ring. 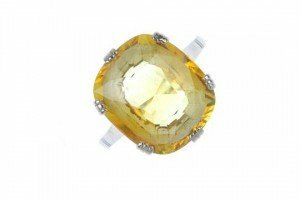 The oval-shape yellow sapphire, to the grooved shoulders and plain band. 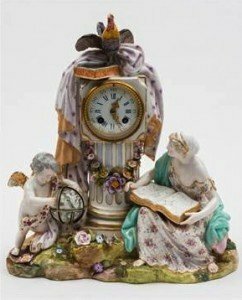 A Continental porcelain figural mantel clock: modelled with a seated barefoot girl with an open book of geometry on her lap and a cherub embracing a terrestrial globe, both flanking a fluted column surmounted with a cockerel, a single volume and fabric drapes, the eight day French movement, striking to a bell, with an enamel dial with Roman and Arabic numerals.